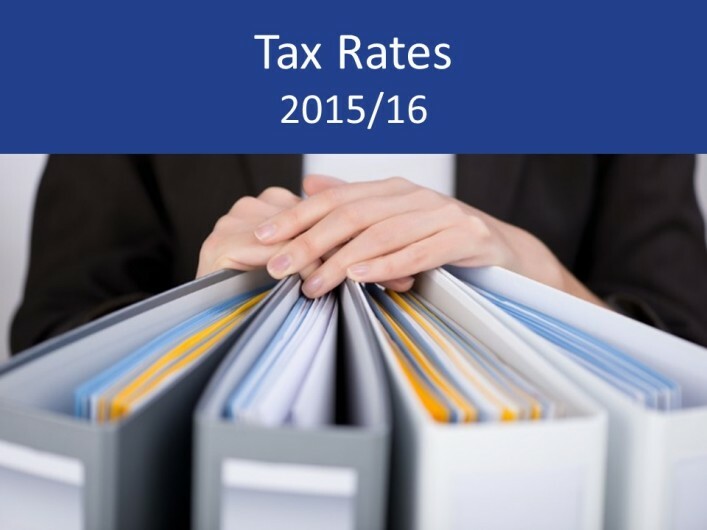 Please navigate our tax rates 2015/16 summary by using the tabs below. The AIA gives a 100% write-off on most types of plant and machinery costs, including integral features and long life assets but not cars, of up to £500,000 p.a. for expenditure incurred on or after 6 April 2014 (1 April 2014 for companies). In his speech on Wednesday 8 July 2015, the Chancellor announced the level of the maximum AIA will now be permanently at £200,000 for all qualifying investment in plant and machinery made on or after 1 January 2016. Special rules apply to accounting periods straddling these dates. For expenditure incurred on cars, costs are generally allocated to one of the two plant and machinery pools. Cars with CO2 emissions not exceeding 130gm/km receive an 18% allowance p.a. Cars with CO2emissions over 130gm/km receive an 8% allowance p.a. *For higher and additional rate taxpayers. *Only applicable to savings income. The rate is not available if taxable non-savings income exceeds £5,000 (£2,880). (Reduce personal allowance by £1 for every £2 of adjusted net income over £100,000. )**£1,060 may be transferable between certain spouses where neither pay tax above the basic rate. *Special rules apply if investments were made before 1.7.14. Investments for 2014/15 cannot exceed £15,000 in total. *Entitlement to contribution-based benefits retained for earnings between £112 and £155 per week. **The rate is 0% in relation to employees under 21 on earnings up to £815 per week. Tax relief available for personal contributions: higher of £3,600 (gross) or 100% of relevant earnings. Any contributions in excess of £40,000, whether personal or by the employer, may be subject to income tax on the individual. The limit may be reduced to £10,000 once money purchase pensions are accessed. You can see our Budget 2015 summary here.